I have to admit that while I love cooking, I try to steer clear of Indian cuisine – it seems like it’s complicated, time-consuming, and mostly I have no idea how to spice it properly. Luckily there is a great alternative in Prague in the form of the Beas Dhaba chain of restaurants, which offers an amazing variety of delicious vegetarian dishes from India. Beas operates six restaurants in total, out of which I am most familiar with the one behind the Národní Třída metro station on Vladislavova 24. I’ve found they usually offer the best range food, however, the difference is not that great. Design-wise, the interior is nothing to get excited about, just your regular hippie-dippie atmosphere, with a framed picture of something positive hanging on the brightly-coloured walls. However, people go to Beas for the food and in that arena, their offer is unparalleled. 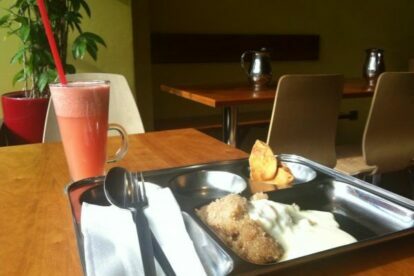 Since it’s self-service, just pick up a metal tray and start filling the compartments with various salads, subji, rice, samosa and don’t forget the wonderful halva with vanilla sauce. Also as a student on a budget, I usually go there an hour before closing time to get a 50% discount. Just a tip for your own safety. Since you pay based on the weight of the food and since the food is quite amazing, you will end up putting too much on your tray, you will end up eating all of it, and you will feel sick afterwards. But it will be so worth it.